The infographic from the LDS Newsroom in my last post, "Mormonism 101 Inforgraphic," raised a few questions and concerns. First, it helps to recognize that infographics of this kind are condensed little factoids aimed at raising awareness and perhaps entertaining, but complex details aren't going to be conveyed well. It also helps to know that this particular batch of factoids is partly based on a recent outside study of Latter-day Saints which, like all studies, has inherent limitations that need to be understood. I discuss the study and the info graphic briefly on my Introduction to the Mormons (LDS Intro) page at JeffLindsay.com. "Mormons in America: Certain in Their Beliefs, Uncertain of Their Place in Society" was published in January 2012 by the Pew Forum on Religion and Public Life. In the full report (a 2 MB PDF) we learn that the study was conducted via phone interviews in late 2011. I believe that means that participants naturally were those who were willing to identify themselves as Mormon to a stranger and who cared enough about religion (or about surveys) to endure the interview. This will skew the results toward active Mormons. The survey, for example, reports that 77% of Mormon say they attend church weekly. But most Mormons know that in their wards or branches, average weekly attendance is under 50% (say, 30-50%) of listed members. So take these factoids with a grain of salt! But the Pew study may be helpful in roughly comparing some traits across religions, if we understand the limitations of the study. For example, after carefully considering this study, you may conclude that active Mormons, unlike most other active Christians, stand out in being much more interested in talking about their religious activity in random surveys. Ah, the fruits of Mormon missionary zeal! "Mormonism 101" at the Mormon Newsroom site offers an interesting infographic about the Church. If one more factoid were to be added, what would you recommend? By the way, if you have contact with Church website folks, let them know that the embed feature for this graphic at Mormonism 101 doesn't work. I think the URL for the image they give is wrong. The Church is still true, even if their HTML sometimes isn't. An LDS Guide to the Yucatán by Daniel Johnson, Jared Cooper, and Derek Gasser (Springville, Utah: Cedar Fort, 2012) is probably my top recommendation for an intelligent, fun, and beautiful LDS book that you will want to own and give to others. It is available as a PDF directly from Cedar Fort (just $9.99), or for Kindle via Amazon. “Intelligent, fun, and beautiful” are compliments I don’t give easily and rarely give all at once, unless, of course, I am talking about my wife. Speaking of my wife, we read this book together during some of our recent travels in China, which have increased our interest in the ancient world and our respect for those who undertake adventure in foreign lands. We both found An LDS Guide to the Yucatán to be enlightening, entertaining, and inspiring. We loved the many sidebars with tangential information on Book of Mormon topics and evidences and on practical travel tips and experiences. We also loved the photography that brings many beautiful Mayan sites to life. I especially appreciated the caution and restraint generally exercised by the authors as they refrained from leaping to extreme conclusions, recognized weaknesses and problems in some pro-Book of Mormon positions, acknowledges alternate explanations, and let the reader know when they were offering speculation or tentative suggestions in applying Mesoamerican finds and legends to Book of Mormon topics. Finally, what I like about this book is the on-site, real-world experience the authors have with their subject matter. It is one thing to discuss what others have written about a site in Mesoamerica. It is another to have been there and examine the terrain and the ruins in detail, to have spoken with its curators and to have witnessed what the state of excavation actually is. There is both a great deal of homework coupled with hands-on investigation behind this book, yet it is presented in a highly readable form with great attention to layout and aesthetics. It’s truly a pleasure to read, to view, and to digest. This book is a follow-up to an earlier book based on travels in Mesoamerica, An LDS Guide to Mesoamerica (Cedar Fort, 2008) which dealt with related Book of Mormon topics based on travels in the adjoining regions of Guatemala, Mexico, and Honduras. Some material on the Yucatan was meant to be included in that volume, but could not be for space considerations. This new volume includes significant added information based on further travels and study. I’m glad they waited for this second book. The authors caught my attention in the opening pages with his discussion of a prophecy from the Book of Chilam Balam, a book with origins in the Yucatan Peninsula . He presents the following tidbit in the context of answering the question, “Why Go to the Yucatan?”--or rather, why should fans of the Book of Mormon care about the Yucatan? My guard was up, though, since intriguing passages of this nature of are often misquoted, taken out of context, or sometimes completely mangled as internet rumors become promoted to faith-promoting stories. But as with so much in this book, the authors have done their homework and have shown care and caution in what they present. The citation has been accurately made from The Book of Chilam Balam of Chumayel. You can read about this Mayan book in the Wikipedia article at http://en.wikipedia.org/wiki/Chilam_Balam by Ralph L. Roys. You can download the book for free at ForgottenBooks.org and verify the citations from pages 116 and 117. Notwithstanding the popular belief that the Maya did not have metal, most museums will have a small display of copper and bronze objects in their Mesoamerican section. We were fortunate enough to have been granted a research visit at the Peabody Museum at Harvard in April of 2007. During this visit, we saw and handled blades and knives of various sizes and configurations from their collections in storage. Some are rough and green with age, but some are still smooth and without copper’s green corrosion, indicative of an alloy like bronze. We also saw large copper spearheads, something we had not known of before and did not expect. Surprisingly, included in this collection are some iron blades and implements, which we saw as well. They are pre-Columbian and were found in mounds in Costa Rica. See the chapter on Kabah for more information. Those who still assert that the Maya had no metal implements must not have visited many museums or read Landa’s description of metal blades and tools. [Landa, Yucatan Before and After the Conquest, pp. 50, 90, 94.] While they did primarily use stone and obsidian as cutting ￼blades, it is certain that they had weapons and tools of metal as well. Just how common these were will probably remain unanswered, as the damp climate of Mesoamerica is not conducive to the preservation of metals. Later some highly interesting material is presented under the header, “Plates of Gold?” They discuss the dredging of an ancient Mayan cenote (water hole) by Edward Thompson, who roughly a century ago found numerous artifacts that he shipped to the Peabody Museum at Harvard, unbeknownst to Mexican authorities. These gold plates are quite remarkable. The detail is astounding, with precise and tiny designs. After inspecting them up close, it is our opinion that very precise and delicate metal tools would be necessary to do such work. The gold itself is very thin, but quite strong and stiff. Most had been crumpled up into balls, either on purpose or by the action of centuries of mud and water, so they have been carefully opened and flattened out as much as possible. Scholars refer to them as disks and believe they are pictured worn or carried by the Toltecs on the murals of the Temple of the Jaguar. For them, they were important symbols of authority and represented portals into the next world and a means of obtaining revelation and prophecy.74 Other gold objects we saw at the museum are small, rectangular sheets, some flat and some curved. Most of these are plain, but some have designs carved into them…. Are these plates directly linked to the Book of Mormon? Obviously not, but they do show that such technology and skills existed by around 400 years after the end of the record. Needless to say, the existence of such artifacts was not even imagined in Joseph Smith’s time. 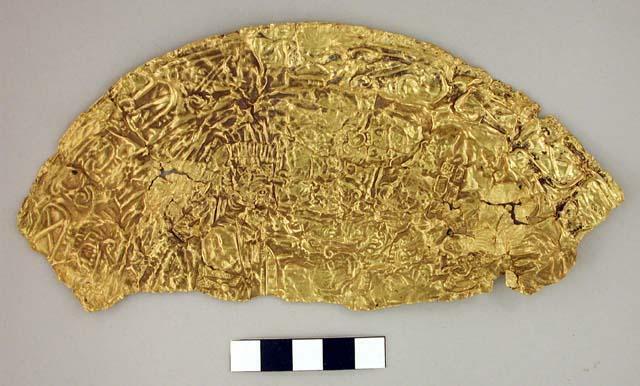 Now, as then, people scoff at the idea of writings on plates of gold in ancient America. However, we suspect that if more people knew of what has been kept in the Peabody for almost a century, the laughter would be less loud. This delicate gold plate contains Mayan glyphs and, though dated too late to directly fit into Book of Mormon timelines, still should be of some interest to Book of Mormon enthusiasts, especially in light of increasingly antiquated objections made to the Book of Mormon based on questions involving metals and writing on gold plates. The authors recognize the limitations of these finds and may even error in understating the significance of the finds. But restraint and caution is a virtue in these matters. That may be too strong a position, in my opinion, but the point is logical in light of what they present. However, their multiple finds recited can still be viewed as scant evidence that may leave room to wonder about human error or other anomalies, and further finds or analysis may be needed to before the case is really closed. The “defense of the Book of Mormon” elements are only a portion of the book, and those not interested in those issues may still enjoy the bulk of the material just for better appreciating the ancient Mayan world and the fascinating experiences of exploring the Yucatan. For me, the mix of Book of Mormon insights, historical insights, photography, and travel experiences made it a constantly interesting and enjoyable book, and one that I intended to share with others as a gift. The book leaves many questions unanswered, which I think is actually an important lesson from this work. Many times the authors indicate how little has actually been excavated at key sites, how little work is now being done, and how little has been preserved from ancient times, meaning that what we now know is rather incomplete and subject to change. They also bring out several examples of established wisdom from the past having been overthrown by new findings in recent years. For those whose testimonies were weakened by pronouncements about the ridiculousness of ancient writing on metal plates, the impossibility of ancient horses in the Americas, or many other critiques of the Book of Mormon based on the sorely limited knowledge of apparent experts, this volume might also be helpful in several ways, if only to open the door to further patience and more thorough study. While the documentation is excellent and the authors have done a great deal of homework in addition physically inspecting the sites in this book, they are not professional archeologists, anthropologists, or linguists specializing in Mayan studies. There is some fascinating material discussing Mayan glyphs and their meaning, as well as their ability to express some Book of Mormon names, but one wonders what qualifies the authors to delve into speculative possibilities with the Mayan language. A discussion of Mayan glyphs and Book of Mormon names in an appendix left me wondering if that material should have been included and if it might be far too speculative or whether it has any merit, something I cannot say since I know nothing about Mayan or other Mesoamerican languages. The ability to express random names with the phonetic units of Mayan is not necessarily meaningful nor even a worthwhile exercise on its own. One of my frustrations about the book is that the authors are not really introduced in the text and the reader is left wondering who these three people are and why they are collaborating for this book. From their blog (http://ldsguide.blogspot.com/), it is clear that the lead author, Daniel, has made multiple trips to Mesoamerica and has led many others to the region on tours. While it is that kind of experience among the authors that adds so much flavor and value to the book, it is not the same as the experience of someone who has been doing the excavating and has years of archaeological scholarship under their belt. That is not to take away from what has been achieved here in this work, but to remind the reader to approach it with reasonable expectations and the ability to exercise the same kind of caution that the authors generally exercise. If I were a Mesoamericanist scholar, I might have numerous issues to challenge and bones to pick (an easy assumption, since studies in Mesoamerica seem to be characterized by a great deal of controversy among the professionals), but given that I am not, it is harder for me to identify gaps in the analysis and discussion from the book. While there is further homework that I need to do, I can still say that I greatly appreciate what these Mesoamerican enthusiasts have provided for the rest of us. Indeed, both my wife and I are much more interested in actually visiting the region now and viewing some of the sites that the authors have brought to life. I congratulate the authors, Daniel Johnson, Jared Cooper, and Derek Gasser, for an enjoyable and original contributions, including some gems from Mesoamerica that have been overlooked before. Kudos also to Cedar Fort for another outstanding volume that should appeal to many Latter-day Saints and those interested in better understanding LDS topics. Mental Illness in the Church: Are We Ministering Effectively? Or Ministering At All? Today I'll point you to an old post of mine at Times and Seasons on mental illness in the Church and ask for further input here. It's one of the most important issues I faced during my time as bishop of the Appleton Second Ward years ago. It was the area where I had the biggest surprises, and also the biggest miracles. Some of the most dramatic events of my life were in that area, dealing with the generally hidden and painful worlds of pain of those struggling with mental illness, including those who have endured the trauma of abuse. Mental illness is as real as a broken leg or crushed spleen, but much harder to treat. The support and sympathy provided is typically far less than for someone hit by a car or even an out-of-control shopping cart, because the injury is not easy to see and many of us think it's "just in their head." Sort of like brain cancer is just in your head. I hope we will be willing to learn more about this area that affects many, many people to varying degrees, and improve our ability to minister with love, the way Christ would if He were here. If you are aware of good resources and websites that can be especially appropriate for LDS members and leaders to improve our ability to help, please let me know. An interesting phenomenon that I've encountered fairly often is the desire of many non-LDS parents to have their kids be Mormon. Sometimes these parents aren't even Christian. This week, for example, my wife and I were blessed to have two wonderful sisters from Thailand teach us how to cook a couple of delicious Thai dishes. In talking with them, we learned of their conversion stories. They are grateful for their non-believing parents who learned about the Church of Jesus Christ of Latter-day Saints and wanted Mormon ways for their children. They had missionaries over, sent them to church, and encouraged them to be baptized and be active in the church, though the parents kept their old ways and beliefs. So why would anyone wish that upon their children? From what I've seen, and in the case of my friends from Thailand, it's usually because the parents know some Mormons and see something tremendously positive that they want their children to have. They see high moral values, healthy living, happy and strong families, nice people, and want that for their kids. The church, of course, is more complicated than that and we have all the problems known to mankind within our ranks, but there's no doubt in my mind that the Gospel of Jesus Christ, as taught and practiced within the Church, in general helps people live better lives, have better families, and find greater happiness. So if it's great for the kids, why not for the whole family? For every parent who wants their kids to be Mormon and ships them off to a local Mormon church or encourages them to listen to the missionaries and be baptized, there are dozens of children who wish their parents would listen and find the peace and happiness they have. Some of these parents who like Mormonism and even see it as something from God might say "It's too late for me," or "I can't change, but my kids can be shaped." Sigh. We can change, at any age, and live happier, healthier lives as we strive to follow Jesus Christ and learn from him. Come on, parents, lead your kids by example and find increased happiness together. It's not that hard. OK, it can be hard and painful, as many aspects of mortality can be, but even those more difficult parts of the religious journey are worth it. Tangential note on the name "Utah"
2 And it shall come to pass in the last days, that the mountain of the Lord’s house shall be established in the top of the mountains, and shall be exalted above the hills; and all enations shall flow unto it. 3 And many people shall go and say, Come ye, and let us go up to the mountain of the Lord, to the house of the God of Jacob; and he will teach us of his ways, and we will walk in his paths: for out of Zion shall go forth the flaw, and the word of the Lord from Jerusalem. The "mountain of the Lord's house" is generally understood to refer to the temple of the Lord, which symbolically is like a mountain. Some LDS people have interpreted this passage, esp. verses 2 and 3, as a prophecy of a future time when a temple will be built in a high, mountainous place that will serve as an international center for the work of gathering the House of Israel. Some have also interpreted verse 3 to mean that there will be two global centers, one in Jerusalem and one in Zion (i.e., the New World Zion), perhaps in the Millennium. If you're looking for possible correlation of the prophecy in Isaiah in a modern setting, some of us Latter-day Saints have the audacity to point to the Salt Lake City Temple built in the mountain heights where we find the international center of the Latter-day Saints, reaching out to nearly all nations to gather scattered Israel and teach the world the restored Gospel. Is it true that Utah got its name from the Ute Indians? Yes, However, it is unclear where the pronunciation came from, as the word Ute is sometimes pronounced "Oot", "Yoot" or "Yutah". Furthermore, the word Ute, means "Land of the Sun" in Ute, and they refer to themselves as who call themselves "Nuciu", or "Noochew", which means, "The People". The word Ute means "Land of the sun" in their language. "Ute" possibly derived from the Western Apache word "yudah", meaning "high up." This has led to the misconception that "Ute" means people high up or mountain people. The mountain link for "Utah" may exist, though it may not be because of what the Utes called themselves but perhaps rather because of what the Pueblos, Apaches, and/or Spanish called them. So one can forgive those who have propagated the misconception mentioned at Wikipedia, including the Utah State Government official website (now archived) which used to contain this statement: "The name "Utah" comes from the Native American "Ute" tribe and means people of the mountains." See also the page at http://www.50states.com/utah.htm, which still (as of Nov. 2012) indicates that the name "Utah" comes from the Native American "Ute" tribe and means "people of the mountains." Well, they are the people of the mountains, as Jan Petit's highly acclaimed book title reminds us. Now if the Utes were and are called the people of the mountains (though not necessarily by themselves), then maybe the name Utah, imposed on would-be Deseret-dwellers by non-Mormons, might fit Isaiah 2 at least well enough for the sake of pleasant irony. Not extremely cool, and maybe not quite as "faith promoting" as some have thought, but still a fun factoid, or semi-factoid in this case. There was a crazy moment in Hong Kong where I tripped and nearly crashed forward, with my body plus camera hanging in the balance, at the precise cusp between disaster and recovery. It came toward the end of a nearly perfect day that began with an easy crossing of the border from China (Shenzhen) into Hong Kong, an uplifting visit to the beautiful Hong Kong Temple where we attended a session that by chance was in the Mongolian language for a group of about 20 hardy, stalwart Saints from Mongolia, followed by teaming up with one of our most inspiring Chinese friends, a young lady who is now a student in Hong Kong. We went together to Hong Kong’s Ngong Ping cable cars that took us up high over the rugged hills to an area with a giant Buddha (marketed as “Big Buddha”—where do they come up with these great names?) and then teamed up with another LDS family, new friends of ours living nearby in Hong Kong. and then took a bus down to Tai-O fishing village for other interesting sites and experiences. We went back up to the Big Buddha area, visited the Buddhist temple and monastery there and were on our way back to the cable cars when I stopped to take a few pictures and was then hurrying back to catch up to my wife and our friend. The crazy moment, the close encounter with my tripping point, happened as I began running. So much seemed to happen in a few seconds. Coming toward me but a little to the side was a possibly attractive female who may have been dressed inappropriately. Perhaps it will come as a surprise to you but even at my age (the age where age doesn’t matter much anymore, mostly because I can’t remember what my age is), ancient temptations do not necessarily fade away and self-control is needed daily. Even old supposedly trustworthy geezers can fall and hurt others. The natural, curious man in me wanted to understand just what temptation I was resisting, but there was at that moment a distinct instruction to myself like this: “Jeff, keep your eyes focused straight ahead. Don’t give her the satisfaction of drawing your attention. Don’t even turn your eyes for a second.” That's what I told myself, and I’m happy to report that I listened. At that same instant, the instant I chose to not be distracted for even a second, my right shoe hit a dangerously raised brick in the walkway as I was jogging and I came as close to losing my balance completely as I think is possible without completely falling. With my expensive, semi-precious SLR camera hanging from my neck, I remember feeling chagrinned about the obliteration it was about to face crashing against the rock, and wondered if I could turn my body enough to shield it as I fell. I also remember feeling embarrassed and worrying about what people would say since I had only recently recovered from another bad fall while rushing down the hard, wet marble steps of our local subway. And then there was the thought, “But maybe I can make it!” as my legs began scrambling forward, first at roughly the same speed as my forward falling torso, and then a little faster, and then, recovery, standing stall again. From the tripping point to the recovery took about 20 meters, and must have been a comic sight, though no friends or family saw it. Had there been any kids or other people in my path across those 20 meters, I think I might have crashed or knocked someone down. And one important lesson for me was this: if my head or eyes had been turned a little to the side when the tripping point came, I suspect that the extra fraction of a second required to bring my focus back to the path in front of me would have made the difference between success and failure. I would have crashed. By the way, I am not saying that it is a sin to even notice a female and that men must walk around with blinders. But for me, in that moment, the counsel to not notice at all, to not be distracted, and to keep my eyes squarely forward was what I needed. Had I ignored that, I am convinced that I would have suffered bodily harm, mental harm (severe embarrassment), and camera harm. However, the most serious downside to the barely-averted disaster is one I would not have even known: had I fallen, we would not have met Selina. This LDS young single adult from Shanghai would have remained alone on the streets of Hong Kong without a place to sleep and without much money. Though she is resilient and resourceful, she probably would have slept in the wrong airport and missed her return flight to Shanghai the next day. And we would all have missed out on a tender mercy of the Lord and a small but genuine miracle. Selina (not her real name) is one of many Young Single Adults in our District of the Church who have come to China, typically to teach English or to study. My wife and I have the greatest calling ever: co-chairs of the Single Adult Committee in the Shanghai International District, which involves traveling together to different branches in the District and working to strengthen the single adults. We are so impressed with these young people, but sometimes they face severe challenges in their journey. Selina was one that we were most concerned for given some of the setbacks she had faced in a bad school situation, etc. She had been in our prayers regularly, and while in Hong Kong, my wife privately wrote her name down on a “prayer role” to express her desire for her welfare. She had Selina on her mind in the house of prayer, but neither of us had any idea that Selina was coming to Hong Kong that day. Selina had come the night before to Shenzhen, China (next to Hong Kong), as had we. She came with another LDS friend who wanted to go to the Temple for our branch temple trip. That friend would go early, and then Selina would cross the border later and the two would meet at the temple later that day. If something went wrong, they would just use their cell phones to reach each other. And finally, they could just meet at Big Buddha, an interesting tourist spot they wanted to see (one of many choices in Hong Kong, and one that I hadn’t even heard of until my Mormanity blog brought me into contact with the new LDS family I mentioned who suggested Big Buddha and the cable cars as a recommended attraction for our visit). Selina’s friend had made the arrangements and had all the details regarding flights and a possible place to stay for their second night. But when Selina crossed the border, the lines were huge and the process confounding. (Hint: use the Luowu crossing and go before 7 am. We had no lines at 6:30 am.) She got to the Temple two hours late, after her friend had given up and gone. What neither of them knew yet was that their phones wouldn’t work at all in Hong Kong. They also didn’t know that it’s not easy to get to Big Buddha, and the normal way involves expensive cable cars that you can’t even get to without waiting in a gargantuan line when they are open (unless you buy tickets ahead of time online, as I did, fortunately)—but I think they were closed or closing by the time Selina managed to get down to that distant corner of Hong Kong. Selina had given up on the cable cars, given up on Big Buddha, and was wondering how she would meet her friend. Not to worry, she thought, as a last resort she could just sleep in the Hong Kong airport that night and hopefully run into her friend there the next day—but that would have been the wrong airport altogether. Selina had wandered over to a plaza not exactly close to the cable car area, not an obvious destination as far as I can tell for groups going to or from the cable cars. She had bought tickets to see a movie and gone into a Subway sandwich shop to grab a sandwich. As we came down from the cable cars, our LDS friends were taking us to visit their apartments in a nearby complex and led us through a shopping plaza on the way . My wife suddenly said, “Selina!” What? Why yes, it was somebody we knew, one of our single adults. She was just crossing the plaza to go to the theatre. A few seconds earlier or later and we would have missed her, In this city of 7 million people, she was an improbably needle in a vast haystack of people. We soon learned her story and realized that she needed help, though this independent and brave young lady might not have realized it then. We took her under our wings and brought her with us (reimbursing her for the movie ticket which we encouraged her to forego). In the apartment of our Hong Kong friends, she was able to use the Internet to send a message to her missing friend with instructions on how to reach us (we would get a call around 11 pm that night and all would turn out well). We fed her and then, after parting with our cool Chinese student friend, took Selina back to Shenzhen (crossing the border into China can also be difficult and confusing without experienced help and we were glad to make it easy for her). We put her up in our hotel and then took her with us to the right airport the next morning, and everything worked out. You can call it a chance coincidence, but we are so grateful to the Lord that he would help her and remind her of His love for her through this little miracle. We hope Selina remember how much she matters to Him and how much He loves her. For us, it was so rewarding to be able to be there at the right time to be a tool to help someone in need. It’s something I would much rather do than picking up pieces of a shattered lens or nursing new cuts and bruises. How many Selina moments have I missed, though, through my selfishness, through my other stumblings and errors in life? The experience motivates me to want to be more careful, to keep my focus more firmly forward in life and to more stoutly resist distractions that might keep me from being useful when there’s a miracle that somebody needs. Maybe I’m the one that needed this little miracle the most. P.S. Practical travel tip when sharing your hotel room: I arose early in the morning and realized that there was a risk of an awkward situation when my wife would later use the shower. To avoid unnecessary awkwardness and risk, I showered first, then quickly dressed and left the hotel room to go work on my computer in the lobby until the girls were all ready to leave. This prevented me from being alone with another female in a hotel room. Sure, I consider myself totally trustworthy and all that. but a key to avoiding trouble, misunderstanding, and even lawsuits years later is staying out of questionable or risky situations as much as possible, even when or especially when trying to do good. Update for gentle readers: In defense of the natural man mentioned above, the natural process of "noticing" people walking toward you is not something to necessarily be shunned. My eyes-to-the-ground approach at that moment could even count as "rude" in some situations. To notice who others are and what they look like is normal--it's lust and inappropriate responses that must be avoided. However, sometimes special eyes-to-the-ground measures are needed in the first place when there might be excessive temptation, or when a klutz is about to plant his face in the concrete. There are a few books I'd like recommend to serious LDS students of the Temple. Several time previously I've mentioned Sinai and Zion: An Entry into the Jewish Bible by Jewish scholar Jon Levenson. Today I'll mention some LDS books you can read online for free, plus some early Christian writings. Mormonism and Early Christianity , Vol. 4 of The Collected Works of Hugh Nibley (Salt Lake City: Deseret Book, 1987) and Temple and Cosmos , Vol. 12 of The Collected Works of Hugh Nibley (Salt Lake City: Deseret Book, 1992) are well worth your time. Just reading the direct quotes from ancient Christian documents - many of which were not even discovered in Joseph Smith's day - will truly surprise you. I can't help but see the LDS Temple as at a restoration of ancient revealed concepts. The "40-day literature," documents discussing the sacred things that Christ taught his disciples during his 40-day ministry after His Resurrection, are especially interesting. These things were sacred and were not intended to be passed on to the world or put into public texts. Also of great value are Nibley's discussion of ancient writings about baptism for the dead, the early Christian prayer circle, sacred vestments, apocryphal writings, geometrical symbols, and more. LDS people familiar with the Temple may be interested in reading the works of St. Cyril of Jerusalem from the Early Church Fathers Site at Wheaton College. I particularly recommend Cyril's discourses on the mysteries found in lectures 19, 20, 21, 22, and 23 at the end of Book 1, especially #21, the lecture on "chrism." But ye have an unction from the Holy One, &c..…that, when He shall appear, we may have confidence, and not be ashamed before Him at His coming. 1. Having been baptized into Christ, and put on Christ, ye have been made conformable to the Son of God; for God having foreordained us unto adoption as sons, made us to be conformed to the body of Christ’s glory. Having therefore become partakers of Christ, ye are properly called Christs, and of you God said, Touch not My Christs, or anointed. Now ye have been made Christs, by receiving the antitype of the Holy Ghost; and all things have been wrought in you by imitation, because ye are images of Christ. He washed in the river Jordan, and having imparted of the fragrance of His Godhead to the waters, He came up from them; and the Holy Ghost in the fulness of His being lighted on Him, like resting upon like. And to you in like manner, after you had come up from the pool of the sacred streams, there was given an Unction, the anti-type of that wherewith Christ was anointed; and this is the Holy Ghost; of whom also the blessed Esaias, in his prophecy respecting Him, said in the person of the Lord, The Spirit of the Lord is upon Me, because He hath anointed Me: He hath sent Me to preach glad tidings to the poor. 2. For Christ was not anointed by men with oil or material ointment, but the Father having before appointed Him to be the Saviour of the whole world, anointed Him with the Holy Ghost, as Peter says, Jesus of Nazareth, whom God anointed with the Holy Ghost. David also the Prophet cried, saying, Thy throne, O God, is for ever and ever; a sceptre of righteousness is the sceptre of Thy kingdom; Thou hast loved righteousness and hated iniquity; therefore God even Thy God hath anointed Thee with the oil of gladness above Thy fellows. And as Christ was in reality crucified, and buried, and raised, and you are in Baptism accounted worthy of being crucified, buried, and raised together with Him in a likeness, so is it with the unction also. As He was anointed with an ideal oil of gladness, that is, with the Holy Ghost, called oil of gladness, because He is the author of spiritual gladness, so ye were anointed with ointment, having been made partakers and fellows of Christ. 3. But beware of supposing this to be plain ointment. For as the Bread of the Eucharist, after the invocation of the Holy Ghost, is mere bread no longer, but the Body of Christ, so also this holy ointment is no more simple ointment, nor (so to say) common, after invocation, but it is Christ’s gift of grace, and, by the advent of the Holy Ghost, is made fit to impart His Divine Nature. Which ointment is symbolically applied to thy forehead and thy other senses; and while thy body is anointed with the visible ointment, thy soul is sanctified by the Holy and life-giving Spirit. 7. Keep This unspotted: for it shall teach you all things, if it abide in you, as you have just heard declared by the blessed John, discoursing much concerning this Unction. For this holy thing is a spiritual safeguard of the body, and salvation of the soul. Of this the blessed Esaias prophesying of old time said, And on this mountain,—(now he calls the Church a mountain elsewhere also, as when he says, In the last days the mountain of the Lord’s house shall be manifest;)—on this mountain shall the Lord make unto all nations a feast; they shall drink wine, they shall drink gladness, they shall anoint themselves with ointment. And that he may make thee sure, hear what he says of this ointment as being mystical; Deliver all these things to the nations, for the counsel of the Lord is unto all nations. Having been anointed, therefore, with this holy ointment, keep it unspotted and unblemished in you, pressing forward by good works, and being made well-pleasing to the Captain of your salvation, Christ Jesus, to whom be glory for ever and ever. Amen. Whether this has any bearing on the LDS Temple concept, I leave it to you to decide. But it's certainly interesting. Maybe even fun. OK, not as fun as watching presidential debates or election coverage, perhaps, but there is a fun factor or two buried in there, if you're a Mormon geek like I am. Why Does the Book of Mormon Seem to Quote Acts 3 in the New Testament When Supposedly Quoting Deuteronomy 18? The latest question added to my LDSFAQ (Mormon Answers) page on "Plagiarism and the Book of Mormon" involves an interesting instance of New Testament language being curiously present in Book of Mormon. The issue involves quotations of Deuteronomy 18:15-19 that seem closer to the language used by Peter in Acts 3 than the language of the Old Testament. The skeptic may then ask if that doesn't that prove Joseph Smith was just copying from a modern Bible and not translating an ancient text? It's a fair question. Deut. 18 is quoted twice in the Book of Mormon, both in 3 Nephi 20:23 and 1 Nephi 22:20, but with different language that more closely follows the way Peter quoted Deuteronomy in Acts 3:22-23. Instead of "requiring it of him," the Book of Mormon passages speak of being "cut off from among the people" and Peter speaks of being "destroyed from among the people," all more severe than the KJV for Deut. 18 and all involving "from among the people" instead of "of him." Sloppiess by Joseph Smith, an inept plagiarizer? It seems clear that Peter rendered the Hebrew "from the people" rather than "from him." Because this is not the reading of the Septuagint (usually cited in New Testament quotations of the Old Testament), and because it is dependent on the Hebrew text rather than the Greek, it is significant that the Book of Mormon scribes understood it in the same way that Peter did. Peter's Hebrew source evidently read the same way as the Deuteronomy passage on the brass plates that Lehi carried out of Jerusalem about 600 BC. 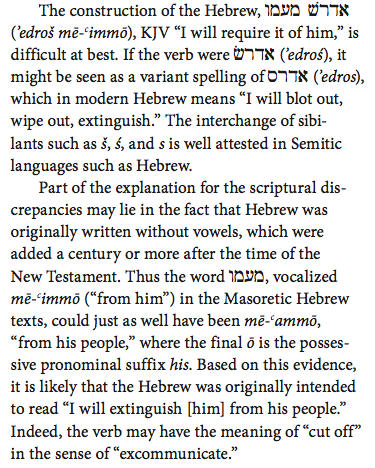 Thus there is a plausible case for the Book of Mormon passages being derived from a reading of the ancient Hebrew text, not just some random passage from the New Testament. In light of that evidence, the Book of Mormon language may indeed be "significant." If Joseph were a plagiarizer, why on earth borrow a New Testament paraphrase of Deuteronomy when the KJV text was right under your nose? What we have is actually plausibly consistent with the theory of an ancient Semitic understanding of Deut. 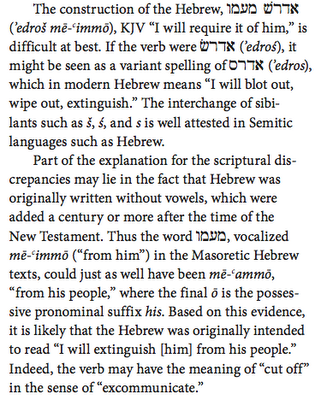 18 perhaps shared both by Peter and the editors of the brass plates that the Nephites had with the Hebrew scriptures. Not proof of anything, but hardly a horrific blunder that destroys the Book of Mormon. It's one of those things like the awkward language of the original text or the wordiness of, say, chiasmus, that rather than pointing to a weakness, may reflect the strength of ancient Semitic origins. Update, Nov 16, 2012: However, as a friend of mine points out, 3 Nephi 20 continues with more language from Acts 3. It seems there is simply New Testament text being used in the translation. Brant Gardner in his former online commentary of the Book of Mormon noted that this is clearly an artifact of the translation process. Just what that process was and how text was quoted and used as a translation aid is open to speculation. Coming to China? The Church is Here, Please Attend! I am surprised over and over at how many Mormons come to China and even move here assuming that the Church just doesn't exist here. There are students here teaching English, for example, that came thinking that their only choice would be to pretty much ignore their faith while here since they thought the Church isn't present in China. Trust me, we are here! Lots of us. We have services and meetings and activities and a lot of fun. We even do home teaching and visiting teaching. There are two large congregations in Shanghai, one meeting each Sunday morning at 8:30 AM and the other at 10:30 AM. In the Shanghai District there are congregations in Hangzhou, Suzhou, and Nanjing, plus the two in Shanghai. There is a Shenzhen District and a Beijing District and other groups around China. If you are coming to China, plan on participating with a congregation in your area, if possible, and if you are too far from a branch of the Church, you can still participate in the Beijing online broadcast of their services. But it's far better to be physically present with a congregation. Parents and friends of students, teachers, or employees coming to China, make sure they know about the presence of the Church here. Make sure their membership records are transferred if they will be staying for a while. If you can't find contact information through Mormon.org or LDS.org, have them contact me and I'll try to help. Travelers who will just be here for a Sunday or two should also know that we have great services and you ought to attend. It's an important part of the China experience and a great networking opportunity also. Plus a chance to renew your spirits. Some of the visits to LDS churches I've made when traveling have resulted in some of the most important connections and friendships in my life. So don't miss the opportunity. Come attend church with us in China! The resignation of Central Intelligence Agency Director David Petraeus over an extramarital affair reminds us of some of the many dangerous consequences of marital infidelity. Espionage 101 teaches that sexual temptation is one of the most important tools for an enemy seeking access to information. What a ridiculous shame that our nation's top security man fell into that old trap. His email was being accessed by his extramarital lover or someone close to her. This kind of thing can do more than undermine a marriage and destroy a career. Many lives can be lost and great harm to an entire nation can occur when those trusted with its defense and its secrets allow enemies in the back door due to their lack of self-control in the face of sexual temptation. Petraeus probably did not intend for this to happen when he chose to cheat on his wife, but through the betrayal of his marriage vows, he has betrayed all of us and may have put some lives in direct jeopardy. Unfortunately, it's not just CIA chiefs, generals, and politicians who are targeted. Each of us has an enemy who seeks to destroy us and our happiness. Destroying our character, our trustworthiness, our marriage, and our family relationships is a top priority for this character, and immorality is one of his most powerful tools, especially when coupled with human pride and vanity. Thanks to the flood of immorality available on the Internet and through the lucrative entertainment industry, his ability to snag us is greater than ever, and constant, prayerful vigilance is needed for us to remain free and stay true to our most sacred commitments and covenants. Marriage matters. Trust matters. Loyalty matters, whether it is to our country or our spouse and children. Infidelity undermines all of that. The selfish pursuit of pleasure makes us less, and less trustworthy, less dependable, less able to serve and make a positive difference in the world. May we each repent swiftly of whatever is moving us or threatens to move us from the trust of our spouse and children, and, for some, from the trust of a nation, and may we return more fully to God and stay clean from the growing sins of this world. May we also demand more from those we ask to serve their nation and recognize that character is not just a private matter but one of public importance. Fidelity, after all, truly matters. From the Pew Forum, "How the Faithful Voted: 2012 Preliminary Analysis" we have exit-poll data on how Mormons voted in 2012 and in 2004 when it was Kerry vs. Bush (hat tip to David Heap). A slightly higher percentage of Mormons supported Obama this time than supported Kerry (21% vs. 19%). Mormons are still highly oriented toward the Republican Party, but it would seem untenable to argue that Romney's religion played a key role in swinging Mormon voters his way or that Mormons voted for a candidate primarily due to his religion. I can testify that at least one faithful Mormon didn't like either candidate and voted Libertarian, though I won't disclose his name to protect his ever dwindling privacy. When Obama won four years ago, my sense was that a lot of Mormons who had opposed Obama could at least have a superficial, momentary sense of pride for the nation in being able to clearly get past its racial problems of the past and elect a black president. Had Romney won, I don't think that the Mormons who opposed him (and his opponents in general) would have had a similar sense of pride for America in being able to elect a Mormon president. I think a sense of terror would be the more common emotion. Maybe I'm reading things wrong, of course. For me, I was hoping that if we did get a Mormon President, perhaps if things went well internationally and economically, and if America somehow ended up looking like a good guy instead of a global brute and spendthrift about to bring down the global economy (and if we didn't blame China for our problems), then perhaps it would create positive interest globally in the Church. Ha ha! Crazy, now that I think about it more clearly. A brief delusion. (The Lord has better ways of opening doors.) I'm now grateful that a Mormon won't be the one blamed for the apparent mess ahead. Can we dodge that bullet by spending more and further deflating our currency? Hmmm, let's give it a try.... It worked for Zimbabwe, right? Go for it, Mr. Bernanke! And good luck, Mr. President. May there be peace. Are Mormons Ready for a Mormon President? Regardless of who wins the election, I worry that there will be a lot of anger from the other side. From my perch in China, it looks like Romney might win. If so, are Mormons braced for their own Hurricane Sandy of religious bigotry from angry detractors? I see a lot of people just completely unprepared to display the tolerance that they demand of others and think the idiotic religious snubs will rise to new levels and sweep the remaining levees of tolerance. Are we ready for that? There is a need for Latter-day Saints on both all sides of this political battle to reach out more effectively to remind people of what our religion really stands for, regardless of whether we agree with the opinions and policies of one very famous and seemingly powerful Mormon. This need will escalate should Romney win. I am worried that whoever wins will ultimately represent the Party rather than the people, as Presidents have to do, it seems. That means I expect the winner to pretty much move the nation in the same direction of excessive spending, excessive international meddling, and excessive interference in the lives of Americans, though the exact vehicle used and the speed of travel down that dangerous road may vary, depending on who's in charge. But a Romney win will make a huge difference for us Mormons, either for good or for bad, depending on how things play out. I hope that he will represent his faith in a positive way and perhaps help others in the world (hello, China!) realize that Mormons aren't all bad. A disastrous presidency could swing things the other way. Sigh. But the opportunity for good is huge, if good can be obtained. So what do we do? Prepare for the future (a future of eroding dollars and difficult times, for the burden of debt cannot be evaded). Share the Gospel more boldly, in appropriate ways, and work harder to counter the flood of hostility we've already seen and the hurricane-force assaults we may yet see over the next 4 to 8 years. Even in the midst of hostility, there will be increasingly large opportunities to increase awareness and share the Gospel. May we touch hearts and open doors through this process, though it may seem pretty painful at times. Part of the pain may come from watching good Latter-day Saints abandon their faith in light of the pressures or their own dissatisfaction with what they may see as politics mingled with Mormonism. There are opportunity for all sorts of gaps in our armor to become targets when the darts get flying in full force. Be prepared. I'm pleased to announce that a very cool friend of ours, Kate Baxter, a student now at Brigham Young University whom we met at Shanghai's best bakery (Nancy's Bakery in PuDong), is about to receive a significant award from China for her impressive contributions during her recent work here. She exemplifies some of the skills and values that I see in many other Brigham Young University students, including great foreign language skills (from serving a Mandarin-speaking LDS mission plus a lot of additional hard work), excellent work ethic, bold vision of the future, the ability to understand and negotiate with others, and a hunger to learn and make a difference in the world. She and her equally outstanding husband, Weston, are well on their way to doing that. Congratulations, Kate, and may the unique talent base at BYU continue to strengthen China and all the nations of the world. Xining, Qinghai—Xining City, the capital of Qinghai, announced that Kate Baxter will be honored with the Xining International Friendship Contribution Award for her work with the Utah-Qinghai EcoParntership. Kate Baxter, a second year graduate student in the Romney Institute for Public Management at Brigham Young University (BYU), is receiving the award for her work fostering stronger relations between the state of Utah and Qinghai province. Her work has included a wide range of programs including the establishment of Chinese and Utahan government official cultural exchange and training program, student exchange programs, continuing the ongoing efforts of the Utah-Qinghai EcoPartnership to establish green technology cooperation between the US and China, and so on. An award ceremony will be held in November on Brigham Young University campus. The award, which is approved by the Qinghai provincial government, Xining city government, and Xining Friendship Association, promotes public and private partnership as well as citizen diplomacy. It emphasizes contributions to Qinghai and Xining, especially in connecting international resources to the supporting and building of Xining as a model for western China as an innovation hub. Baxter is the first recipient of this award which has been described by Xining city officials as a similar recognition to a lifetime achievement award. Baxter is the first student to ever win an international award in the city, province, and possibly nation. The Utah-Qinghai EcoPartnership is a non-profit organization dedicated to building relationships, encouraging all levels of government and business exchange, protecting intellectual property, and developing green technologies. Some examples of their work include aiding the creation of the sister-city relationship between Xining City and Utah County governments, Qinghai Normal University and Utah Valley University’s sister-school exchange program, the partnership of Xining middle school district with the city of Bountiful for a student exchange program, as well as a training and cultural exchange program for Chinese and Utahan government officials called the green town development. These partnerships and cooperative programs have resulted in several awards and recognitions including that in September of 2012, Qinghai Province and Utah State were honored with the national award for Best Cooperation from the Chinese People’s Association for Friendship with Foreign Countries. Earlier, in June of 2012, Xining City (the capital of Qinghai) won the service award from the Ministry of Foreign Affairs of the People’s Republic of China. Even further back on July 13 of 2011, Utah and Qinghai became sister-states. This relationship is recognized at the US and China national level as the Utah-Qinghai EcoPartnership, the only state level EcoPartnership program through the US Department of State.